Goodbye 2016! As I sit and finalize all of my year end paperwork and files I reflect on how great and not-so-great the season was for me this year. It was a fantastic growing year and a great learning year business wise. This was the first time I had sold products from my lavender, and joined a local farmers market. I also have my products in a store as well. Lots of lessons learned, and lots of things to look forward to! I am grateful for all of the wonderful people I met along my journey, and all of the advice I have learned along the way. I am already busy planning for 2017. Now that the greenhouse is finished, I am putting in plant orders for Spring. I am ordering half of my lavender online for next year, and half I am picking up locally. I am so excited for Spring I can’t stand it. This year I spent 40% of my time with my plants during the season and it seems like 60% or more trying to get my business started. I want to change that next year and really put the time in with my field that I am putting in and work in my greenhouse. Selling products and meeting people is extremely rewarding, but working the land and tending the plants is where my passion lies. 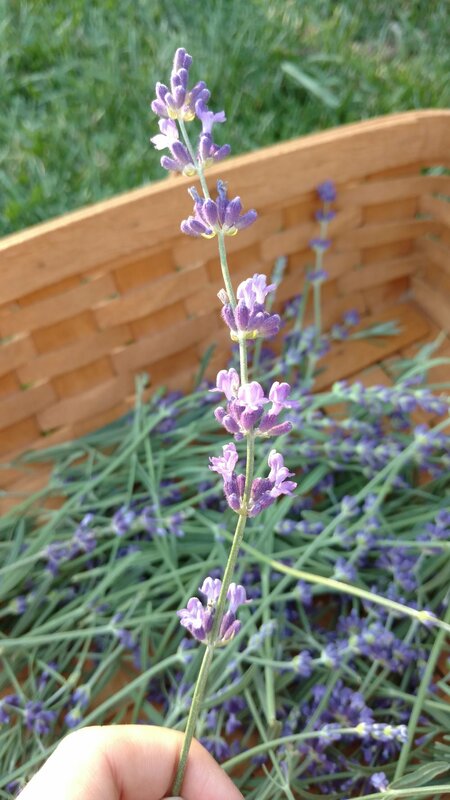 I was so fortunate that I worked so hard when I planted my lavender that they were incredibly self-sufficient, hardly needing my care except for harvesting the blooms and weeding from time to time. I currently have 9 varieties with my current crop, and look to expand to 6 more next Spring. It will be tough these next few months as we keep getting buried in snow to stay busy and get ready for next year. I unfortunately will not be able to attend the USLGA conference that will be held in late January, however volunteered to create Region 8’s centerpiece for our group to represent all the amazing farmers in our region. I will post pictures of how it turns out, and hope that in a small way I can help contribute to our region with my creativity. Stay tuned on my Instagram account for continued updates from life in Aurora as we battle the cold and long for the sun. Here’s to 2017 and more adventures ahead! Imagine having the opportunity to pretend for a moment that you are in France, walking through the lavender fields of Provence. Except you are able to save a ton of money on travel and get to stay in your own backyard. By backyard, I mean Ohio’s friendly neighbor, the great state of Michigan. Earlier this year, I was invited to join the Great Lakes Lavender Growers of USLGA for a Fall meeting that would take place in Michigan later in September. Our region consists of Wisconsin, Michigan, the southern half of Minnesota, the northern half of Illinois, the northern half of Indiana, and the northern half of Ohio. I have been excited for this meeting ever since it was announced. 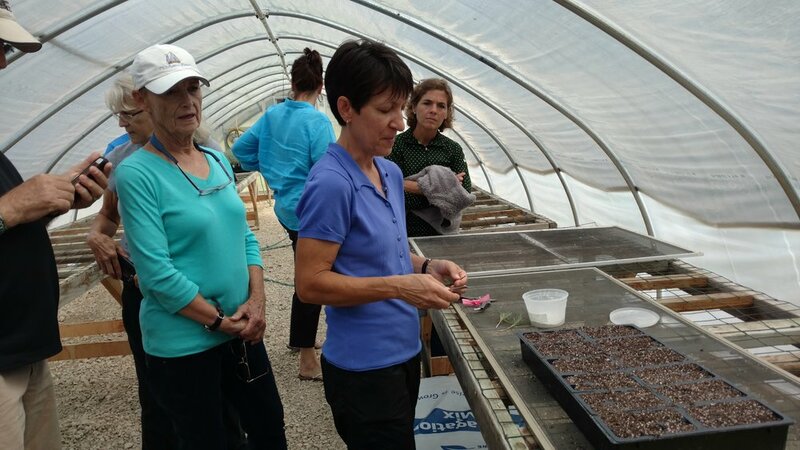 I was fortunate enough to take my mother as my guest, and share my passion of lavender growing with her. My family has been extremely supportive of me as I navigate through my own growing adventures, dreaming of tending a lavender hobby farm some day. 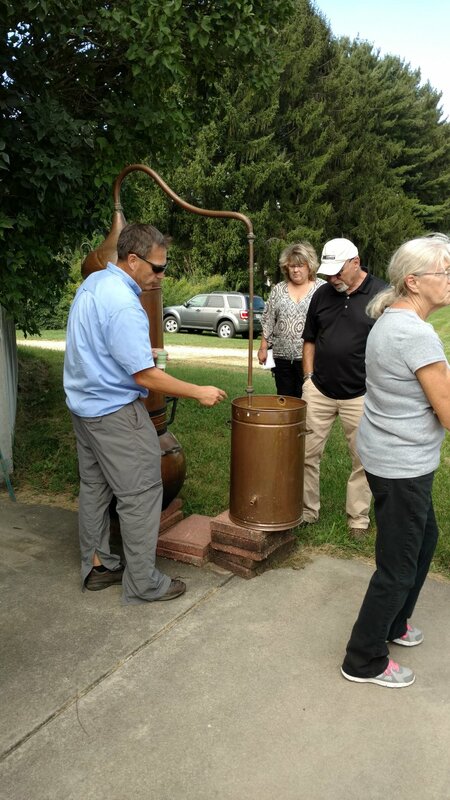 In turn, mom was able to share with the group about her and my father’s business, Traditions Engraving, and how they are extremely interested in partnering with the Great Lakes Lavender Growers members to promote their farms and products with some of our ideas and marketing strategies. Working with Traditions Engraving has put my business on another level, inspiring me to reach out to other local lavender farms in hopes of collaborating to promote their businesses. Having a master’s degree in graphic design and specializing in packaging and product design, branding, and visual communication, it is a goal of mind to offer my creative talents to fellow lavender growers of USLGA and help their business thrive, working together to make their farms even more successful than they already are. 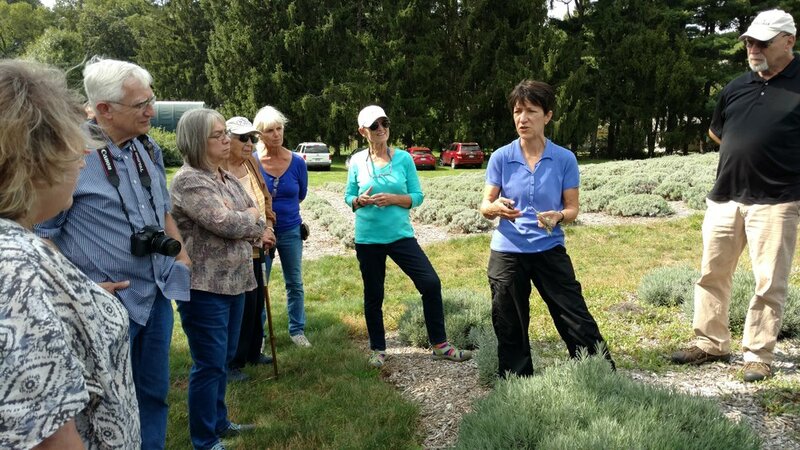 I can’t thank Laurie Hejduk enough from Luvin Lavender Farm for setting up this incredible trip and creating an amazing network of lavender growers in our Great Lakes area. I am looking forward to our next get together! 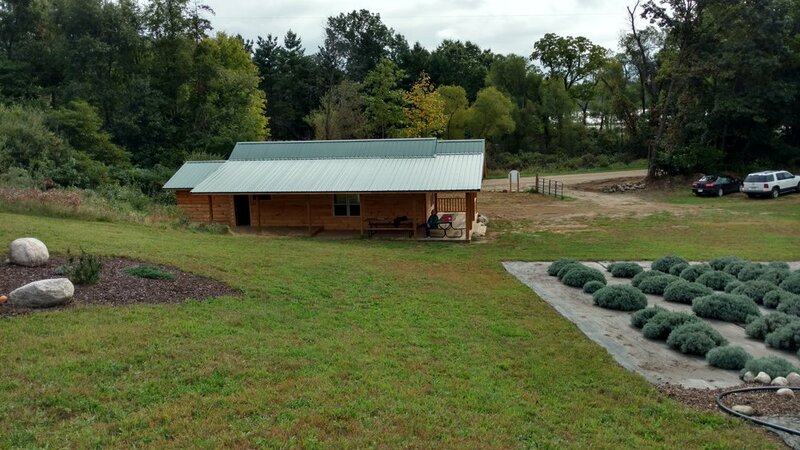 Below are the three farms I was able to visit over the two day trip and their website information. I highly encourage you to check them out! Each set-up was unique, and all three owners shared a wealth of information with the group, which I am completely grateful for. Waiting in anticipation to check out the field. This is exactly the set-up I would like to do on my property. I am a huge fan of pea gravel mulching. The Great Lakes Lavender Growers region 8 group. These are the members that were able to travel for our regional meeting. Extradorindary group of people! Walking to the lavender field and drying shed. Cranberry Lake Lavender had a gorgeous sign! Would love to incorporate this idea on my property! The scent of the lavender was unbelievable. The group learned a lot from owner Jane DeHart, Vice President of USLGA. A demo of an amazing lavender debudder. I don't have nearly enough lavender to use one of these, but it was fascinating to watch and try out. 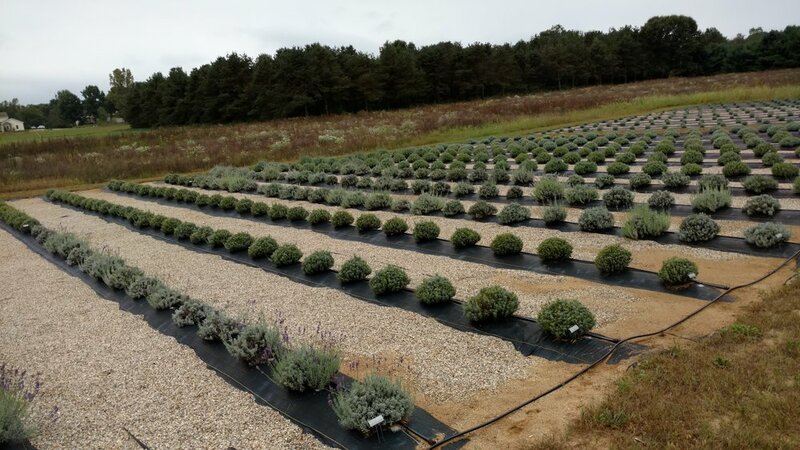 A little over 4,000 lavender plants. Amazing! Yum! 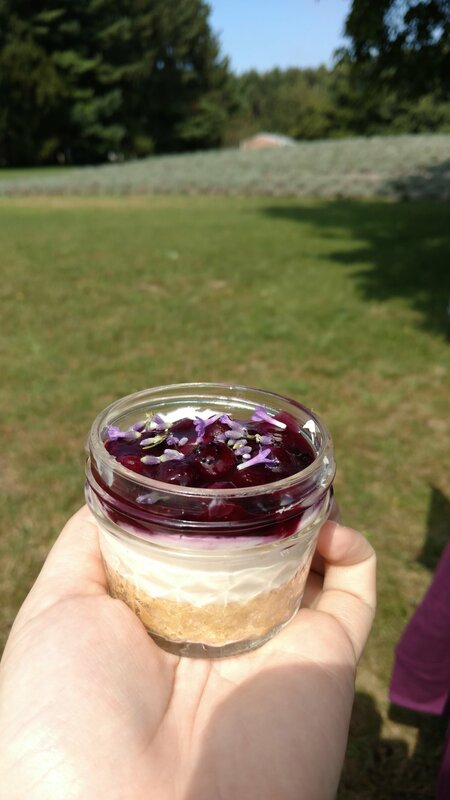 After enjoying a wonderful catered lunch on the farm, we all were treated to a delicious dessert of lemon cheesecake in a jar topped with blueberries and fresh lavender. 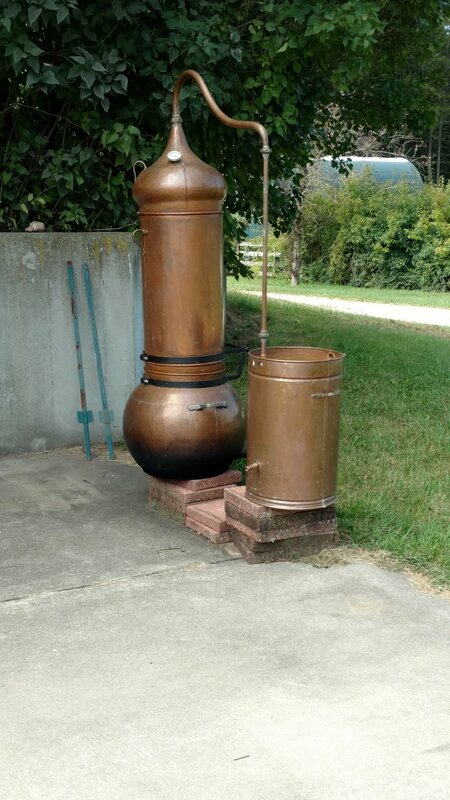 Very impressive 100 liter still/distiller. USLGA board member Martha Wilczynski showing the group how to propagate lavender through a cutting demonstration. I learned so many great tips on how to do this with my own plants. I can't wait to finish the greenhouse! It has been very busy here working the last few days of the lavender season. We successfully wrapped up our time at the Red Rock Farmers Market in Aurora, and met a lot of great vendors and made new contacts. Wasn’t the most financially profitable endeavor, but we definitely got our name out there. The was a huge goal of mine–introducing ourselves to the community. We have been invited to quite a few fall and winter opportunities which is wonderful. This labor day weekend, I found myself tending to the plants in preparation for the upcoming fall and winter season. 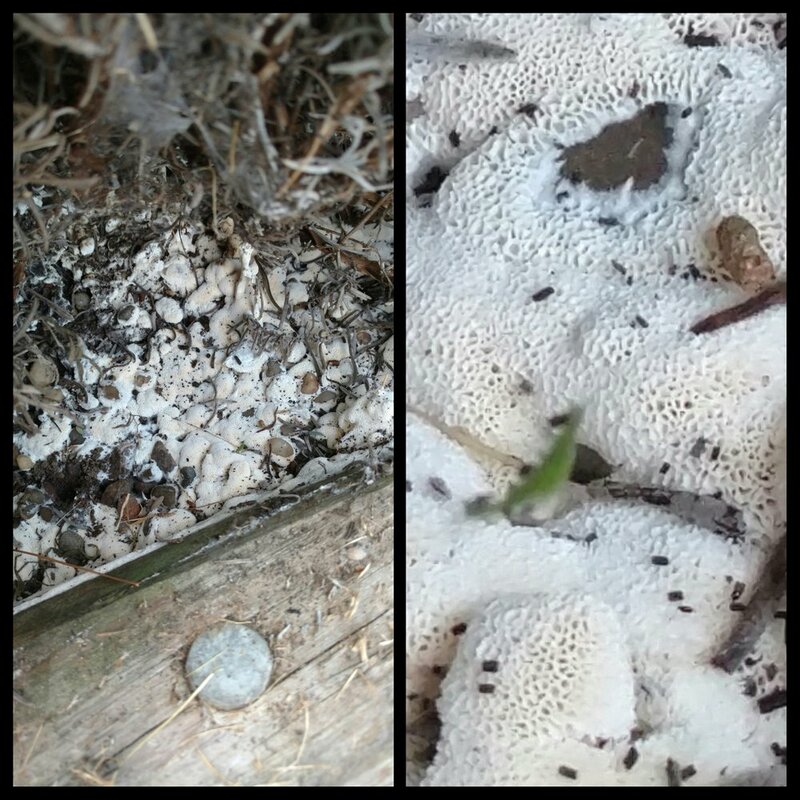 Earlier this summer, I was having a strange problem with my Munstead plants and discovered with the help of seasoned USLGA members, that I am dealing with a case of slime mold. My Munstead is really out of control, and trapping a lot of moisture at the bases. Next spring, it will be a big job to go in and cut out a lot of the plants and open up areas for more successful air circulation. 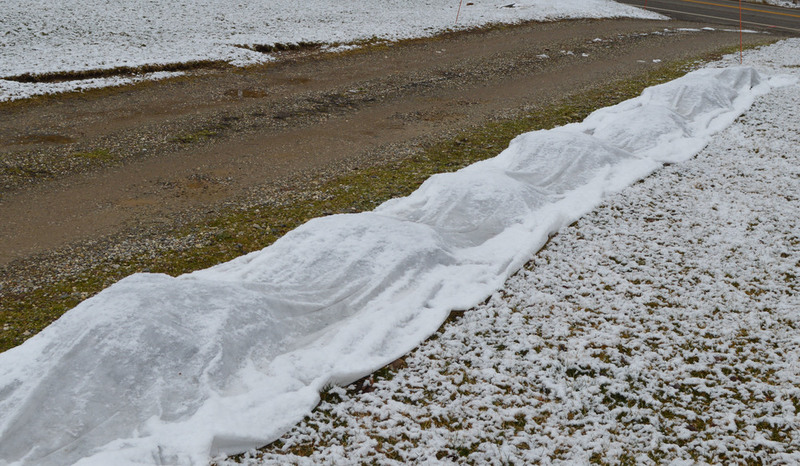 For now, all the plants are hopefully winding down and will go dormant until next spring. The good news is is the slime mold "organism" is not a threat, just a nuisance and unsightly, and hopefully will calm down with the upcoming cooler temps. 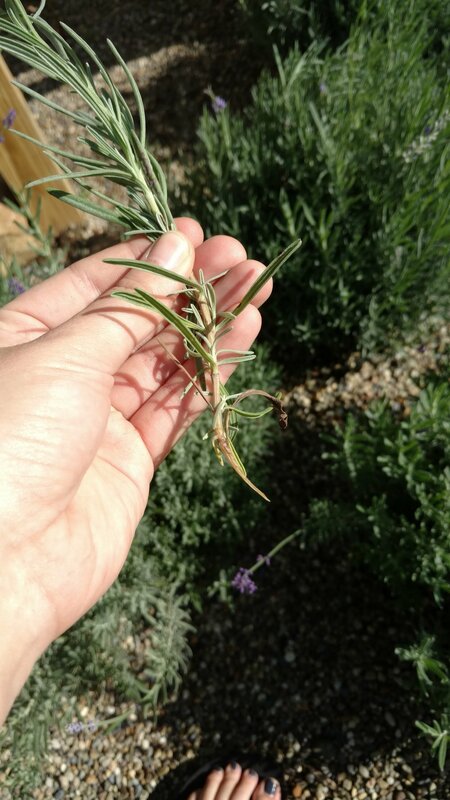 This summer, I wanted to try and see how successful I could be with gathering some hard and soft wood cuttings of my Provence and Hidcote plants. I read a lot about the process and decided to give it a try. Will know for sure in about 8 months if I will have strong enough plants to transplant next Spring. Fingers crossed! 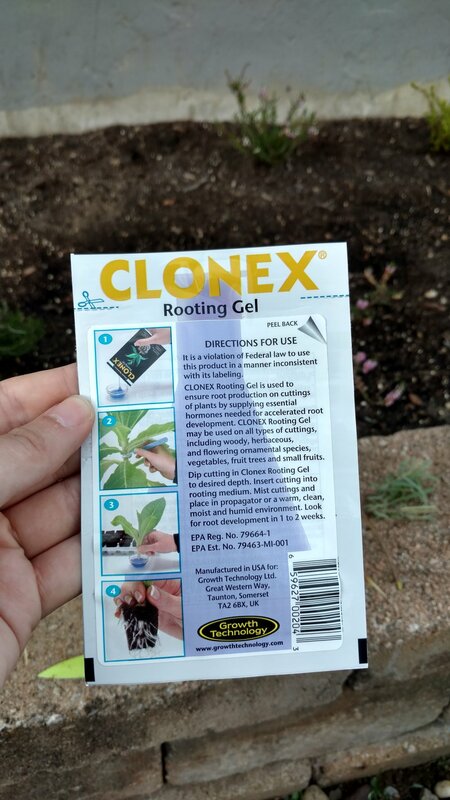 I spent a lot of money on healthy, strong, larger plants, so seeing if cloning them makes sense and could be a great money saver. 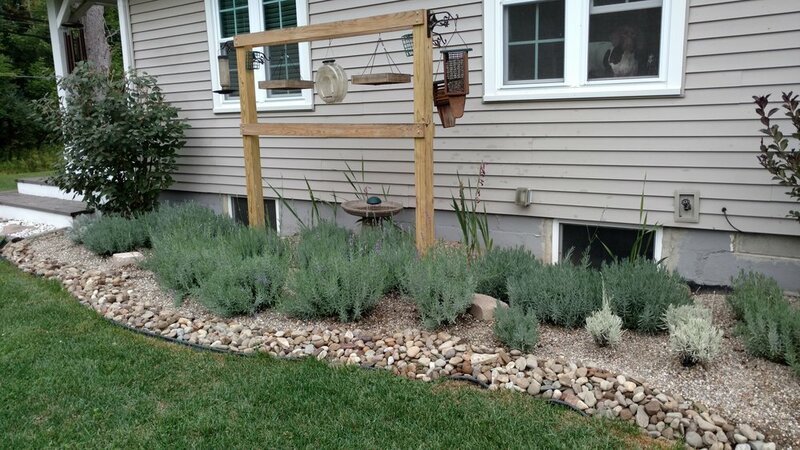 Finally, I pruned all of the lavender in preparation for the cooler temperatures and fall weather transition. I was amazed by how much growth I was able to trim down and how easy, yet tedious it was to shape all of the plants (except the Munstead). I have a wheelbarrow full of lavender leaves that I am not entirely sure what to do with. Some people I know recycle these parts, and they sure smell wonderful. Looking forward to our Great Lakes regional USLGA meeting and farm tours September 23-24th. Cant wait to meet neighboring lavender farmers and swap stories and advice. Will post pictures of my time in Michigan! Until then, keep checking back for updates to the website and my social media! Today could not have been more perfect weather to visit my friends in Madison, Ohio at Luvin Lavender Farms. This is a true lavender farm with the best family you could meet. As soon as we pulled up, I was in heaven. It was so great to see all of the wonderful guests, and how excited everyone was to walk through the gorgeous lavender. I reconnected with Laurie, her husband Mike, and nephew Doug who are all members of USLGA and head the Great Lakes Region of our chapter. Enjoy the photos from the festival. Someday soon I hope to have lavender as big and beautiful as this farm! Today, the greenhouse building has officially started! When I originally purchased my greenhouse, I bought it with a wood anchoring kit thinking my father and uncle could come to Aurora to build a floating deck with me to sit the structure on. After a quick check in for a quote at the local Home Depot, I realized there was no way I could afford that! 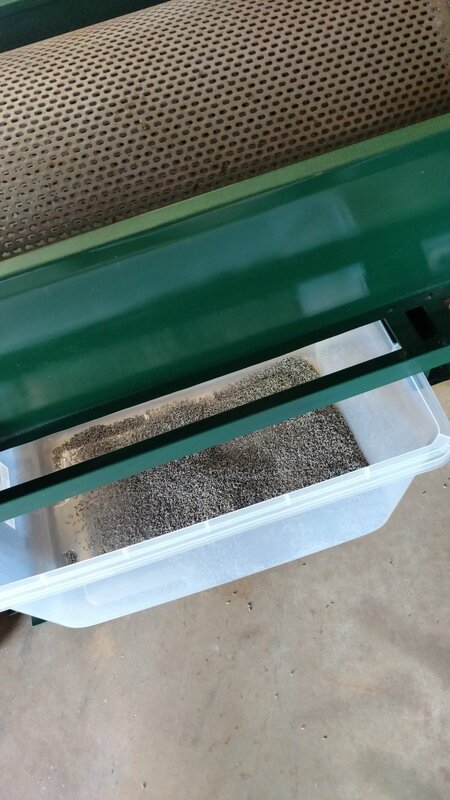 In doing my research, I learned that anchoring it into the earth and using a pea gravel base is the perfect route to go, besides being way cheaper! Grandio quickly exchanged my anchoring kit, and we were off to start the base unit with my new earth anchoring kit. Did I mention that we haven't had rain for several weeks in Northeast, Ohio? In looking at our new kit and base instructions, we knew we had to dig 10, 14 inch holes in order to sink the anchors and pour cement. Never in our lives had we seen such bone dry soil. The photos do not do justice. 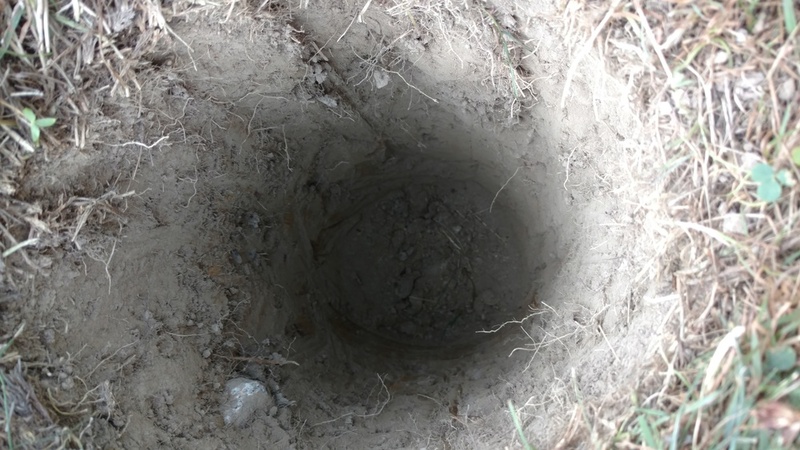 It was so dry it took us hours to dig the holes with a post hole digger and small shovels. Plus a lot of breaks being 87-90 degrees. I cant thank my dad enough for traveling so far to come help us with the greenhouse. It was great to visit while we worked, as I learn so much when I work with him. I am truly excited to watch the greenhouse take shape. 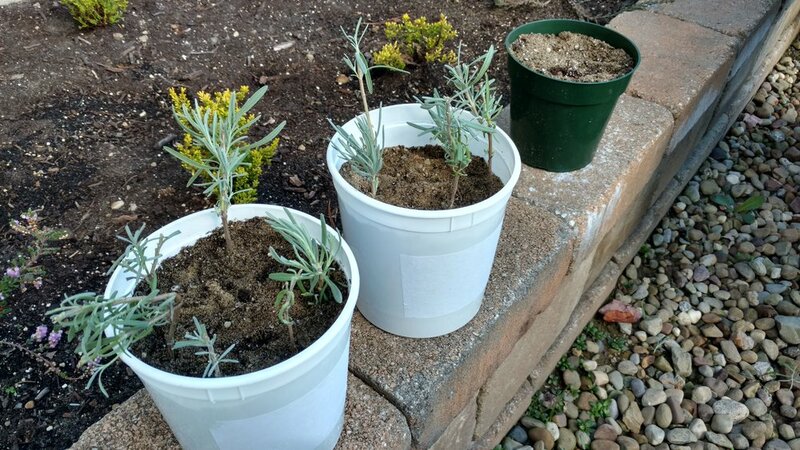 This is where I will be starting lavender from seed, raising cuttings from my current plants, and also trying more French and Spanish varieties in containers that I haven't had much success with outside. My collection is ever growing. Stay tuned for the structure building! Working in the shade with the help of the tent canopy. The dry dirt was unbelievable! Getting ready to pour the cement for the anchors! The Barn Owl box will be right behind the greenhouse. Still no Barnies yet, but not giving up hope. Cabela checking out the base. Do you see how dry and brown the grass is? This is nothing compared to part of the yard. Praying for rain. This weekend, the temps are suppose to soar to 97 degrees. Very excited to announce that at the beginning of July, I joined the Herb Society of America! I have always been interested in this group and am so happy to become an official member. I feel extremely lucky that this organization is basically in my backyard! Kirtland, Ohio, where HSA is located is a 35 min drive away. To be that close to such an amazing organization with so many resources is a dream come true. Cant wait for my first visit. If only they were open when I wasn't at work! Last Wednesday night, we made it to our first market. We were told it was a slow one, since most people were in downtown Cleveland celebrating the Cleveland Cavs victory parade. Nonetheless, we had so much fun and met a lot of great people. We sold a lot too! Very excited for our next market. We will be having dried bundles and lavender fire starters. Items we didn't have last week since they were still drying! Finally have all of my lavender cut! 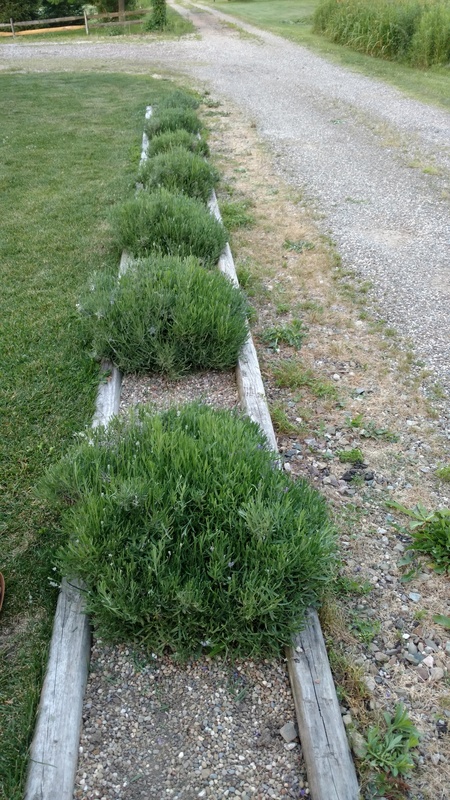 Last year, I was only able to put together 7 bundles of my lavender. I left it way too long for the bees, and only salvaged a small batch of bundles. Those bundles got me through many, many batches of candles over the winter. This year, we made 97! I would have had a handful more, but decided to turn some of the phenomenal would be bundles into gorgeous lavender wands. I can't imagine how many I will have when I get the raised bed and greenhouse put together. Enjoy some photos from my various varieties. These lavenders were all cut down in the last week in a half. 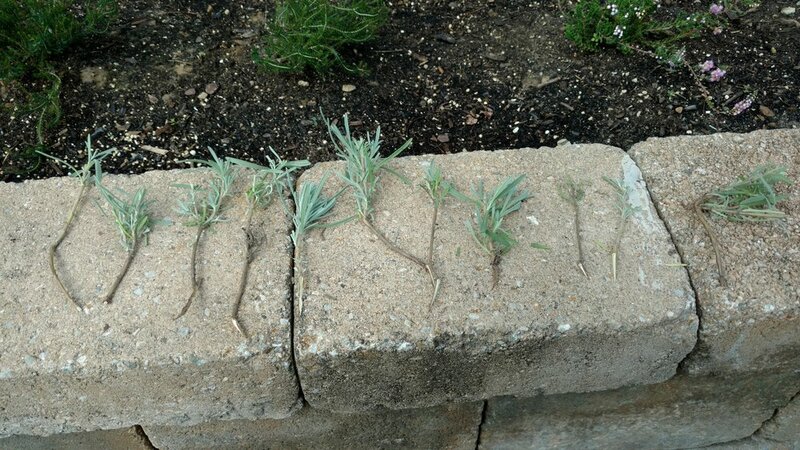 Already, some of the lavender that was cut first is springing back to life! Will have one last cut of the flowers in late Summer, and then a deep pruning of the plants in the Fall, making sure they last during the winter with the heavy snows we get here in Northeast, Ohio. It has been thrilling to follow along on Instagram various lavender farms around the United States and the excitement of their blooms and their harvests. Planting two weeks earlier this year really put me in a great spot. I cant wait for my lavender's second bloom! Hello friends! It has been awhile since I posted last. I have been busy obtaining the permit that I need from my City to start building my new greenhouse! I am so very excited. The raised beds I have picked out have already arrived as well, and I am still figuring out where I will be placing them around the greenhouse. I have decided after several sketches and drafts that I will be growing munstead, hidcote, provence, and grosso in the new beds. 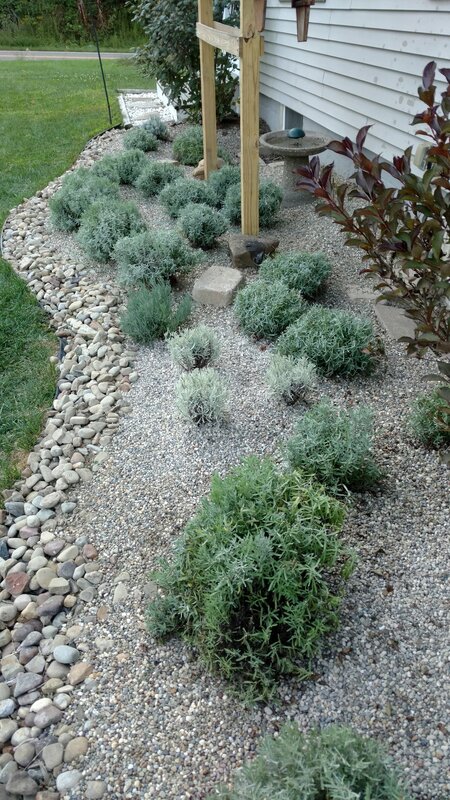 I think that I will give me a nice variety to add to and compliment my 30 lavenders at the front of my property that are absolutely thriving! Below is a photo of my gorgeous hidcote that is blooming before all of the rest! I am disappointed as I work to make products for the upcoming local farmer's market, that Bee Loved Lavender will unfortunately miss the first two markets. I have critical work travel for my job that I must attend to, so I will have to really push hard when I return to make the best impression with customers once I see them on the third scheduled market. Still very hopeful that it will be tons of fun, and people will enjoy the wonders of lavender with the products I am selling! Lavender season has begun! I have been watching in admiration online on my various social media accounts everyone across the US getting their lavender fields ready this year. 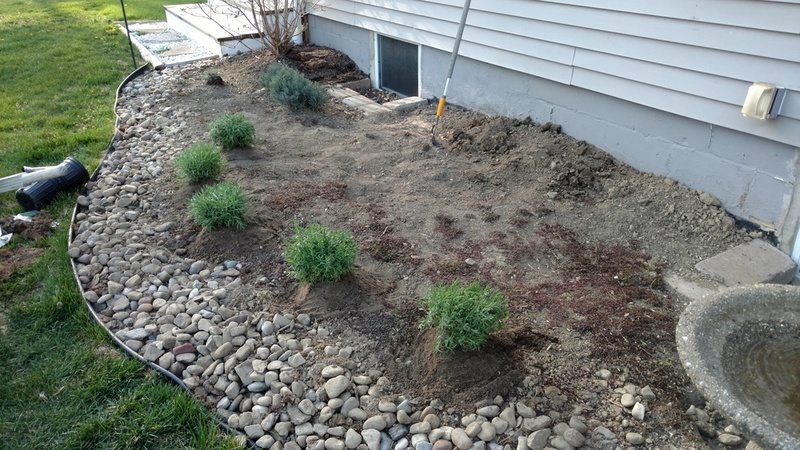 I have been working the landscaping in front of my house for the past week getting it ready to plant some new lavender. I also tended to my established munstead and phenomenal beauties as they stretch towards the sun and start changing from their dormant silvery green leaves to new bright green ones. I know my neighbors think I'm crazy as I fuss over my lavender so much. I will weed around them and sing as I go. I was visited by several bees as I weeded, buzzing around the plants looking for purple blossoms. Soon I told them. Visiting a local greenhouse over the weekend I was shocked to see two lavenders that I had such problems finding locally last summer. I had to have them for the front of my house. I am the new proud owner of 5 hidcote and 5 provence lavender plants! My collection has grown to 24 plants now, with 50 more coming this summer in raised beds. My mini farm is coming to life! I absolutely love bringing new lavender home. I carefully sat them outside in their pots for part of the week so they could get use to my location vs the greenhouse. I watched the weather intently knowing I wanted to plant them right before it rained. I worked very hard to clear the bed and finally finished planting last night. Now the hard part. Crossing my fingers and hoping they take. Last year, I watched my munstead do very well for a few days after planting, but then started to droop and look terrible. I panicked and wanted to water them, but gave them time. I was told by a friend that this was normal, and that the plants concentrate their energy once newly planted to their roots to anchor in and get a good grip. Sure enough, 7-10 days later the plants sprung back to life, and have been thriving ever since. I am so glad I had my experience from last year to help me plant these newbies. 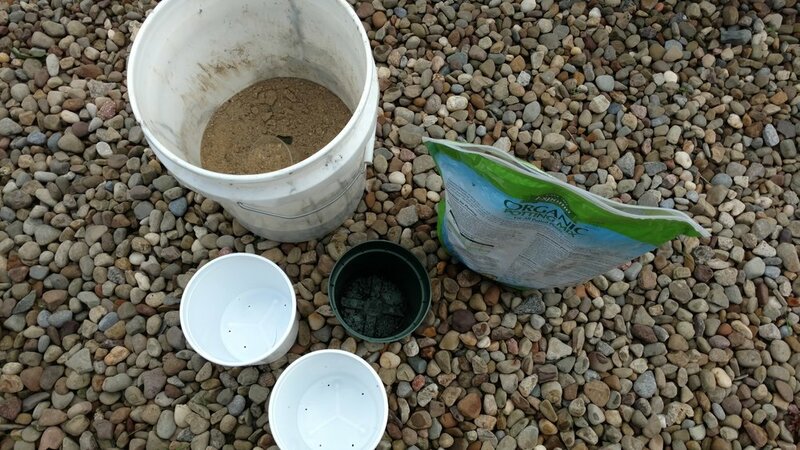 I work hard to make sure each and every plant has proper drainage, filling each hole with sand, pea gravel, and river rock, before mounding the plants with good soil mixed with even more sand. Soon, I will be mulching in the entire bed with pea gravel, since it worked so well for the munstead bed. I can not wait to start on the raised beds next month. This is going to be a great summer I just know it! I have been traveling for work a lot lately, and it has been hard to be away from my lavender projects. I did steal some time this weekend to be with my family, and had some fun making some really awesome bath and body products. I cant wait to experiment more and see which ones work the best! We made bath bombs and soaps, and they smell heavenly. I am so disappointed that it keeps snowing out, but that's Ohio for you! Spring weather can not get here fast enough. My plans for my mini farm are growing, and so are my dreams of getting outside and working the side field. I was so excited for the first day of Spring over the weekend, ready to kick-off all of my big Spring and Summer plans for Bee Loved Lavender. Instead, I was greeted by a fresh dusting of snow. Gotta love Ohio! Being the busy bee that I am, I got to work pouring the most gorgeous candles with our new glass hobnail jars. Just in time for Easter! These are Bee Love's largest candle (20 oz!) and are sure to make the perfect gift for Easter. I already have people asking what I have ready for Mother's Day! Waiting for spring is tough here in Ohio. Outside, my lavender is still tucked under its winter cloth, waiting to stretch and feel the warm sunlight. Inside however, I have been patiently experimenting with growing lavender from seed. 4 of the 8 species needed to go through a stratification process, however the 4 that did not were planted on Valentines day. I am fascinated by which ones sprouted first and which ones are just now poking through the soil. I made a chart (see below) that shows in what quadrant of the seed tray I planted the 8 species. At the end of this experiment, I will post my chart where I scribbled the dates in which the sprouts emerged. Very fun to watch and document. Can you believe the pods with the most sprouts came from my English Munstead? These seeds were gathered from the plants (now tucked under their winter blanket) I grew this summer and buds I use in my soy wax products. This year, I will be growing more plants from cuttings. Growing from seeds has been a fun way to pass the time until the snow melts. Stay tuned! Hands down the best lavender lemon shortbread recipe out there. Have made these cookies for friends and family and have had requests to create a "mix kit" to sell so others can enjoy making these delicious cookies too. Perfect treat to pair with hot tea. 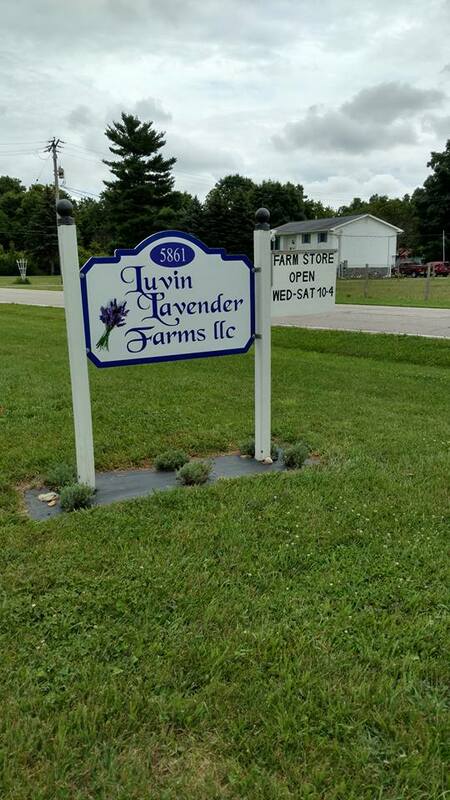 Over the summer I met the wonderful owners of Luvin Lavender Farm at a nature/garden craft fair near where I live. I was so impressed with the products they were selling and the interest their tent was getting, and asked how I could learn more. They immediately suggested that I join the United States Lavender Growers Association (USLGA). That afternoon, I immediately signed up, and have been a proud member ever since. 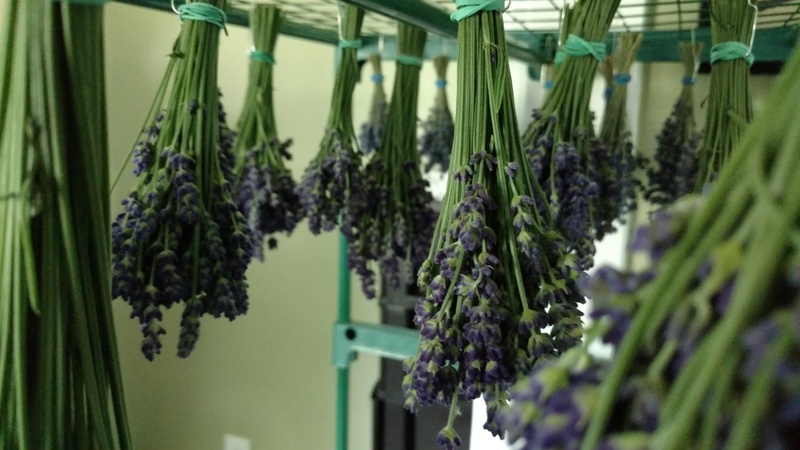 The United States Lavender Growers Association was formed to support and promote the United States Lavender industry. 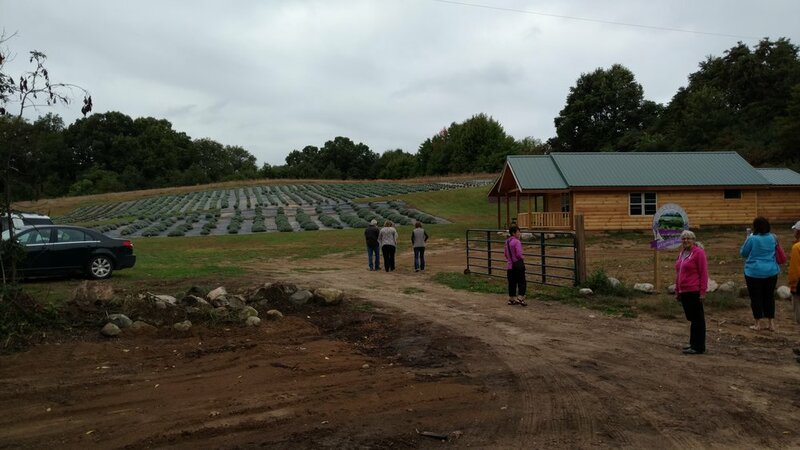 USLGA allows a collective voice for lavender growers in the U.S. 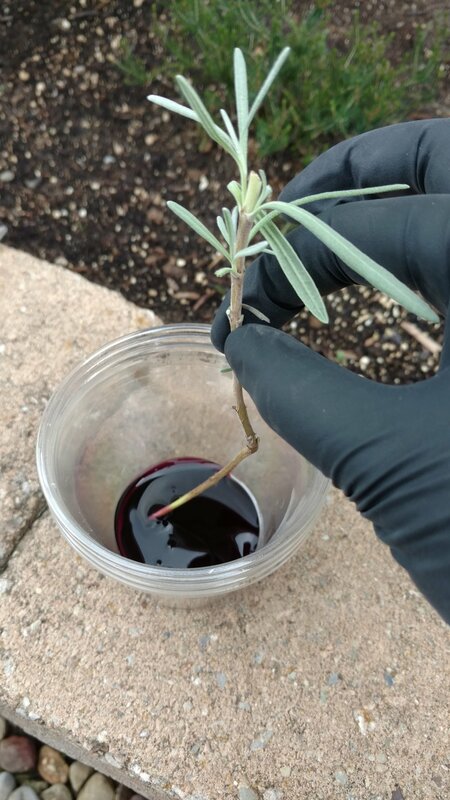 It supports lavender farms, connect growers to buyers and provide continual education for both lavender growers and lavender users. USLGA has been a huge resource as I work with my plants, and a source of support as I formulate plans to expand my small plot of trial plants into a mini lavender farm on my property. 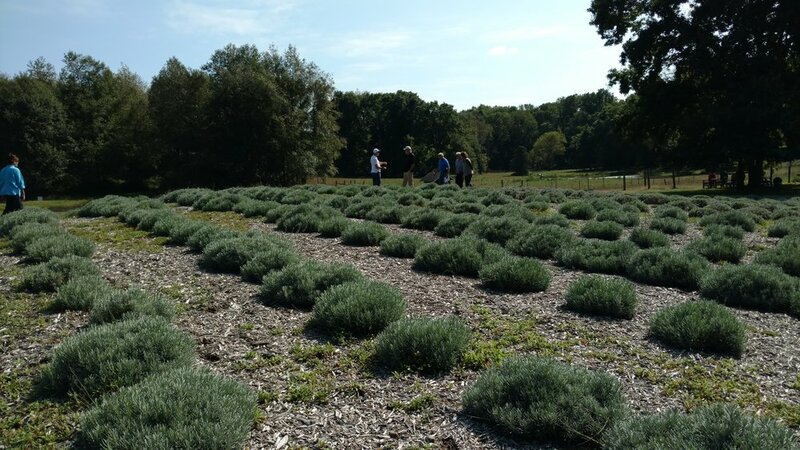 I am a member of USLGA's Region 8 team and have been excited to learn that our region leader is none other than the friends I made over the summer, the group at Luvin Lavender Farms. I am very excited for the US Lavender Conference in 2017, and hope to be able to attend. More to come on my adventures with USLGA and Region 8 activities.